The dictionary meaning of the word "Hajj" connotes facing a big and important matter that is respected, visitation and going somewhere and coming back. As a term of Islamic jurisprudence, it signifies a worship that is performed by Muslims who have the means in specified period of time in a fashion that follows religious requirements in the Kaba, Arafat, Muzdalifa and Mina. Hajj, which is one of the five pillars of Islam, is an act of worship which demonstrates that Muslims are brothers and sisters who are all equal to one another. 2. What is the religious ruling of Hajj? 3. Who can perform Hajj? - For women whose spouses have died or who are divorced to have completed the period of iddah (waiting following a divorce or spousal death). 4. What other rulings is there on Hajj other than what has been made obligatory? There are two other kinds of Hajj stemming from religious rulings; these are wajib (obligatory at a level less than fard) and nafila (supererogatory). Hajj that is wajib is one that is performed by a person even though it is not obligatory on them but is incumbent upon them as it is a compensation Hajj (supererogatory) for one that has been abandoned. 5. How many times must Hajj be performed? It is obligatory for Hajj to be performed by Muslims who have the means to do so at least once in their lifetime. Ones performed after the initial one is considered supererogatory. 6. At which point in life must a person perform Hajj? According to Islamic principals, Hajj is obligatory upon a person as soon as they have the financial means to do so. Islamic scholars have stated differing opinions on whether it is obligatory for Muslims to perform Hajj the very year they are able to do so. However the main criteria here is this: A person who delays their Hajj to later years from the year in which they have means, may lose this opportunity for various reasons and will bear the responsibility for the Hajj which he or she didn't perform even though he or she could at the time. For this reason, it is generally advised that one must perform Hajj as soon as possible. 7. What is [which acts are] obligatory during Hajj? - Shaving or shortening of the hair. - Following the order of most (at least four) of these elements. 8. What should be done if one of these mandatory requirements is not completed? The Hajj will not be authenticated unless all of the obligatory steps are completed or the penalty or financial atonement is paid. In this case, the incomplete obligatory step(s) must be completed or the Hajj must be compensated for in full (repeated). The dictionary meaning of Ihram is what needs to be revered or entering a place or time. In the context of Hajj, the word means is a person forbidding themselves of certain acts that are halal at other times, in order that they may perform Hajj or umrah or both. Everything that is forbidden during this phase is known as the ihram prohibitions. 10. What are the ihram prohibitions? "For Hajj are the months well known. If any one undertakes that duty therein, Let there be no obscenity, nor wickedness, nor wrangling in the Hajj. And whatever good ye do, (be sure) Allah knoweth it. And take a provision (With you) for the journey, but the best of provisions is right conduct. So fear Me, o ye that are wise." (Surah Al-Baqarah, 197). 12. How does one make intention for ihram? In order to intend for ihram, one must determine in their hearts whether the worship to be performed is umrah or Hajj, or both umrah and Hajj. It is neither encouraged nor forbidden to make this intention orally. Once they have made the intention, it is time for talbiya. 13. Why is the phrase "Labbayk" repeated? Talbiya, whose dictionary meaning is following an order, means uttering sentences that with "labbayk" during Hajj. Talbiya is comprised of words the person who submits to which will befit the glory of Allah. Talbiya must be said orally out loud. It is not sufficient for it to be said the heart. 14. What is waqfa? How is it performed? 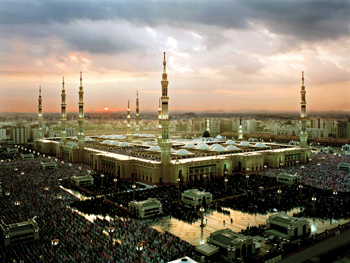 Waqfa, whose dictionary definition means staying at a certain place for a certain amount of time, as a Hajj term connotes a person who has worn the ihram with the intention of performing hajj, staying in Arafat for a certain period of time following noon on the 9the day of the month of Dhulhijjah. The period of Waqfa is until fajr (dawn) the next day. Arafat also has an important historical and symbolic meaning as well. The place where Prophet Adam and Eve met after being brought down from heaven was called Arafat, and the day on which they met is called "Arafa." 15. What is the Muzdalifa waqfa? It is sufficient to remain in the time frame set in the borders of Muzdalifa and to pass through there in order to fulfill the Muzdalifa waqfa. In order for the Muzdalifa waqfa to take place, one must be in ihram, have completed the Arafa waqfa and remain in Muzdalifa within a certain time frame. The regulation on the Muzdalifa waqfa is wajib (mandatory). The time of the Muzdalifa waqfa is determined as beginning from the first day of Eid ul Adha from fajri sadiq (dawn from the line in the horizon) until the actual rising of the sun. 16. What is tawaf? How is it performed? The dictionary definition of tawaf, which means turning and traveling, means turning around the kabah seven times beginning with the point at which the Hajar ul Aswad stone is located. Each of these turns is called Shawt. There are different kinds of tawaf, however, there is a ‘visitation tawaf' which comprises the obligatory portion of the hajj. - The Arafat waqfa must be completed. - It must have been completed in the allotted time. - To perform tawaf around the Kaba and within the Masjidi Haram. - To fulfill at least four elements of the tawaf. - To have ablution while performing tawaf. - The physical parts of the body which require to be covered, must be. - Beginning the first turn around the Kaba prior to the line of the Hajar ul Aswad. - To walk while performing tawaf. - The complete the tawaf in seven shawt. - To perform the tawaf prayer at the very end. 17. When should the visitation tawaf be performed? The first day of Eid ul Adha begins with the rise of fajri sadiq (dawn at the beginning at the level of the horizon) It will not be accepted should it be performed before this time. Because the first night of eid until the rise of the sun, has actually been allotted to the waqfa of Arafat. The dictionary definition of sa'i, which means to perform a task, walk and run, in terms of hajj, means going between the hills of Safa and Marwa -- starting at Safa going four times and returning three times -- located east of the Masjid-i Haram, following the tawaf performed at hajj or umrah. Sa'i is comprised of a total of seven shawt with the journey between Safa and Marwa being one shawt, and the return to Safa from Marwa another shawt. 19. Why is sa'i performed? Sa'i is based on the actions of Hajar (Hagar) (pbuh), the wife of Prophet Abraham, who ran between the hills of Safa and Marwa in order to find water for her son, Ismail (pbuh) The sa'i has been performed between these two hills to commemorate them. 20. What happens during Mina? "Mina," is the area located between Muzdalifa and Mecca within Harem borders. There are three duties performed in Mina on the days of Eid ul Adha (The 10,11,12 and 13th of Dhulhijjah); the stoning of satan, the sacrifice of an animal and shaving. 21. What is ramy al jimar? The dictionary definition of ramy al-jimar means "the throwing of small stones," however, as a term related to hajj, it means casting a certain number of stones called "jamarat" at certain locations. Satan had tried to prevent Prophet Abraham from sacrificing his son, an order which Allah the Almighty had given to the prophet. Consequently, Prophet Ibrahim, his wife Hajar and son Ismail, realized the trap that Satan's was planning and cast stones on him. The ramy al-jimar symbolizes this event. The duty of stoning Satan takes places in Mina during the days of Eid ul Adha. Stoning Satan is one of the fundamental obligatory acts of hajj. It is sunnah to spend the night at Mina during the days in which the stoning Satan takes place. 22. Are there any stops outside of Mecca during the hajj journey? 23. What is the ruling on visitation of the Prophet's grave? These hadith and similar narrations are the sources of information which lead Islamic scholars to say that visiting the Prophet's grave is one of the most virtuous acts recommended by Islam. Furthermore, some Hanafi scholars have even stated that this visitation is a sunnah which verges on mandatory for those who have the ability and means to do so. Please type '478' into this field.